Back to basics, then, as the new academic year starts. Which courts decide human rights cases, when, and by what rules? Well, the easy one is domestic courts. They decide whether a public authority has acted or omitted to act unlawfully under the Human Rights Act. If the act is a decision about housing or immigration status or prisoners’ rights, the courts can quash it, and so tell the decision-maker either to decide it again or if there is only one lawful answer, tell the decision-maker what decision to take. If it was a past course of conduct (unlawful detention, intrusion into privacy, unacceptable pollution), they may award damages for human rights breaches. If the domestic law is itself unlawful, and cannot be interpreted HR-compliantly, the domestic courts can make a declaration of incompatibility under s.4 of HRA – it does the claimant no good in respect of his claim, though it throws a huge gauntlet down to Parliament to do something about the non-compliant law. And in the criminal courts, the obvious sanction is to dismiss the prosecution for some abuse of process involving the defendant’s human rights. But, hang on, why don’t we take our human rights case first time out to the European Court of Human Rights in Strasbourg, particularly as we have ben told that we don’t have to pay anything to the other side if we lose (not something which usually happens in the domestic courts)? This is where we hit a problem – you can only go to Strasbourg when you have exhausted all domestic remedies “according to the generally recognised rules of international law and within a period of six months from the date on which the final decision was taken.” – Article 35 of the ECHR. So, not so easy then. Say you have a case which is very difficult to win under UK law, but your chances are better in Strasbourg. A good example would be where you have a Supreme Court precedent against you, but a recent Strasbourg case with you – e.g. Keyu, decided last week, on which a post will shortly follow. This means you have to try out your human rights arguments before a judge, fail, and then try and fail before the Court of Appeal (and Supreme Court, if you are allowed to get that far). The idea of “exhaustion” of domestic remedies is twofold, first that you give the member state the opportunity of preventing or putting right the violations alleged against it, and second, you don’t clog up the Strasbourg courts with unnecessary cases which could be dealt with in, say, your local county court. Not something that the judges there (including our new man, Paul Mahoney – on the left in the image – with 30 years of administrating the ECtHR behind him) would like at all. For more detail on what is meant by “exhaustion of local remedies” see Rosalind English’s post on the subject. But now there is another European Court, and one which the tabloids (and the odd broadsheet) endlessly muddle up with the Strasbourg court. Its full name is the Court of Justice of the European Union, and it sits in Luxembourg. As the name on the tin suggests, it determines issues of European Union law. It has two bits, the Full Court and the General Court, the latter a less than helpful re-brand of its previous role as the Court of First Instance. European Union law contains human rights law, because human rights principles are part of EU law and have (belt and braces) also now been copied into the EU Charter (what is the Charter? – see this post). But remember EU law is not just about mergers and milk quotas and faceless corporations. Most of our environmental law is European in origin. Free movement of EU citizens lies behind great swathes of immigration law. Public health, consumer protection, freedom of information, VAT, employment, discrimination, you name it, and if you scratch hard enough, you will find that much of it bears the brand of Brussels (where the laws are made) or Luxembourg (where the cases are decided). So in any such case, you may find a Euro-point – for example, the post I did recently about wanting to rely on an English default judgment in Latvia – using an EU regulation about recognition of those judgments. And once you have a Euro-point, you may have an Article 6 ECHR fair trial point, etc etc. So how do you get on the plane to the Luxembourg court without finding that your journey is wasted? This is where it becomes a bit more difficult. Broadly, cases with private party claimants end up there for two reasons. First, you have persuaded a domestic court that the case raises some difficult point of European law, and therefore the domestic court refers the case to Luxembourg to answer that point of law, under Article 267 TFEU. Again, take my Latvian Article 6(1) challenge as an example. Luxembourg helped the Latvians with the law (a bit), but left it to the Latvian courts then to find the facts and apply that law. So not all plain sailing, given that it takes 18 months or so to get there, and sometimes in really difficult cases you might have to go there twice if the CJEU comes up with a particularly opaque set of answers first time round. Secondly, you can start proceedings directly in Luxembourg, but only (putting it simply) when you want directly to challenge some European law or measure, saying that it is unlawful by reference to another bit of EU law (which might include a bit of human rights principles) – here one has to reach for Article 263 TFEU In such a case, where you are challenging a bit of Euro-law or Euro-decision, and want to have it set aside or annulled, you have no choice. Domestic courts don’t have the power to do this, so you have to go to Luxembourg. For examples of these proceedings and the very restrictive rules as to standing which apply to them, see my posts here (a challenge to an EU trade law about seal fur) and here (about the EU Commission’s decisions about enforcement of pesticides and air quality rules). But, where you have the choice, why would you want to persuade the CJEU to answer your Euro-human rights issue? The main reason is that some arguments simply go down better with the “civil” lawyers who make up most of the judges on the Court – “civil” (click here for a bit of Wiki-learning on this) as opposed to the common-law (or judge-made) tradition in which the UK (and only the UK in the EU) operates. Our domestic judges have become far more accustomed to dealing with some of the broad principles of EU law (such as proportionality or judicial effectiveness), but even so a supranational court may be more receptive to arguments which, say, threaten some sacred cow of common-law rule-making which looks a bit odd from a continental perspective. So that’s sorted then, into its nice little boxes. But just you wait until the EU signs up formally to the ECHR (as it has to under Article 6 of the Lisbon Treaty), such that you can take the EU (and the CJEU?) to the Strasbourg Court – how will that be organised? Answer is, we don’t know the details, but see an earlier post for a taster. For more on the human rights basics, see our Introduction to Human Rights as well as our index of each of the rights contained in the European Court of Human Rights. 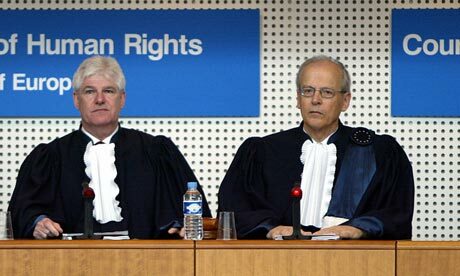 Each Article of the ECHR has its own page with links to blog posts relating to them. What is “exhaustion of local remedies”, for the purposes of applying to Strasbourg? The EU Charter: are we in or are we out? What have the Inuits to do with keeping EU law in check? Thank you very much for this interesting debate which I believe indicates just how difficult it is to define what is a Human Right? Habeas Corpus to my mind should be supreme – it is still used. Why should people who are “sectioned” under the Mental Health Act have fewer rights than even prisoners? There is no mention of the UN Declaration of Human Rights, Dec 10 1948. Flowing from this Declaration is Article 16 of the Convention against Torture and other Cruel, Inhuman or Degrading Treatment or Punishment. You will be aware this Article specifically states: “…at the instigation of or with the consent or acquiescence of a public official or other person acting in an official capacity…..” There are examples in Britain where public officials authorise the building of machinery so close to peoples homes that the escaping pulsating acoustic pollution causes violation of the right to health by virtue of extensive dosage of sleep deprivation, anguish, fear, fatigue, humiliation, etc. The authorisations are despite warnings by independent Acousticians who predict the long periods of sleep deprivation. The only recourse appears in Nuisance, but why are the UN in Geneve not interested, who is responsible for enforcing the UN Conventions flowing from the 1948 Declaration? dont know what you mean by:to be ‘an air of Lon Fuller’s hapless King Rex’ Human right writing sounds like gobbley gook to me. Do they use such language so we dont understand? More to the point do they understand. Or is it what one calls ‘smoking mirrors ‘ ‘an elephant in the room? 1.The lack of rules or law, which leads to ad-hoc and inconsistent adjudication. 2.Failure to publicize or make known the rules of law. 3.Unclear or obscure legislation that is impossible to understand. 6.Demands that are beyond the power of the subjects and the ruled. 7.Unstable legislation (ex. daily revisions of laws). Having a legal system whereby there are three separate court structures interpreting three different (if closely interlinked) sources of law (EU, ECHR, UK domestic) does seem akin to the fictional Rex’s hapless efforts. It certainly is not what one would devise if starting from scratch, I venture to suggest. Article 13 was omitted from the Human Rights Act 1998 (i wonder why) did they not want an effective remedy? Both the European Court of Human Rights and our Court of Appeal both have one thing in common – they make decisions based on the advice and facts given in a case lawyers report neither body allows you to see. In the case of the Court of Appeal a bench memorandum and in the case of Europe the rapporteurs report. Fair and transparent? I think not. Strangely three decisions in the European Court state that adviosry opinions requested by litigant must be disclosed prior to hearing if requested. one rule for them and one rule for us – yet the English Courts refuse to obey the precedents set by Europe!!! I am fascinated to read this blog about Human Rights as the UK seems to be in a dither as to whether or not we should actually have them or not. Habeas Corpus is still used but for how much longer? Will a Bill of Rights be superior to any EU legislation? Will the individual nations of Northern Ireland, Wales, Scotland and England have different and separate Rights? What happens if Scotland becomes Devolution Max? What happens if Scotland gains full independence? Whose rights prevail when there are competing interests such as people who are deemed to be mentally incapacitous? Whose rights prevail when there are competing interests such as people who are deemed to have mental health problems – and don’t forget that the Department of Health has stated that a quarter of the population at some point in their lives has mental health problems/illness. Can it ever be justified under Article 8 of the Human Rights Act to detain a person on grounds of “health and safety” when the person him or herself wishes NOT to be placed in detention regardless of what anyone else says? This is the root problem in my opinion of Mental Health and Mental Capacity legislation that it is the “Nanny knows best” mentality that removes individual freedom of liberty, freedom of expression, freedom of thought and freedom to make choices. In effect, I hope that the Mental Health Act 2007 and Mental Capacity Act 2005 are demolished by the Human Rights legislation. Article 5 is basically the Habeas Corpus article, which has been derogated from in the past by the UK, which was subsequently defeated in the Courts. Habeas Corpus itself without the Article 5 HAS been suspended before in the past by Parliament. The only way I could see a Bill of Rights being superior is if Parliament repealled the European Communities Act 1972 and withdraw from the European Union and also pull out of the Convention. But thats an entirely theoretical debate surrounding Parliamentary Soverignty. European Union law is pretty much already superior if you look at Factortame and McCarthy v Smith but note what Lord Denning said ‘If the time should come when our Parliament deliberately passes an Act — with the intention of repudiating the Treaty or any provision in it — or intentionally of acting inconsistently with it — and says so in express terms — then . . . it would be the duty of our courts to follow the statute of our Parliament’ – Hence the theoretical issue of Parliament intentionally surrendering it’s soverignty etc. In relation to mental health, I think there are tribunals called Mental Health Review Tribunals which a detainee can challenge such decision, but don’t take my word on it, its not really my area. In order to have mental health legislation altered (very unlikely to demolish) you would have to prove that it’s provisions are incompatible with Convention Rights, and even then the courts can only make a declaration via s.4 of the HRA which isn’t legally binding upon Parliament. In Hobbs v UK  App. No 63684/00 the ECtHR held that a declaration of incompatibility is not a sufficiently effective remedy for the purposes of the Convention and in Burden v UK  Application No 13378/05 the ECtHR confirmed that applicants who’s only remedy is a declaration of incompatibility may not be required to make a claim in national courts. I agree that if you have absolutely no chance at all domestically because some statute is dead against you, you can try to go direct. But most HR arguments don’t fall into that category. In which case let’s be realistic about it. Most claims (particularly judicial reviews) have a domestic timeframe. Too late,and you are out. So it is no good going to Strasbourg, getting kicked out as being inadmissible, and then finding you cant claim here. It would take very bold advice to say in an arguable claim -don’t bother in the UK, because you will convince Strasbourg that you did not need to exhaust local remedies. definitely wrong …Azelle needs to go read article 35 again.